It's the work of the Devil. That's what some say when a bizarre series of deaths strikes a 14th-century monastery. Others find links between the deaths and the book of Revelation. But Brother William of Baskerville thinks otherwise. He intends to find a murderer by using fact and reason - the tools of heresy. Best Actor British Academy Award winner Sean Connery is wily William in this compelling adaptation of Umberto Eco's bestseller. Christian Slater plays Adso, aide to the sleuthing cleric and a youth on the verge of sexual and intellectual awakening. F. Murray Abraham is arrogance incarnate as the Inquisitor. Director Jean-Jacques Annaud filmed this moody mystery at an actual 12th-century monastery where hooded faces loom like gargoyles. Back in 1986, The Name of the Rose made very little impact with American audiences. It took in a mere $7 million and quickly vanished from screens. However, it obviously built a cult fanbase over the years, for its 2004 DVD release provoked a level of interest much greater than one would expect for an obscure then-18-year-old box office bomb. Rose presents a very unusual detective story. Set in a 14th century Italian monastery, we meet Brother William of Baskerville (Sean Connery), a monk who comes for a debate between his Franciscan order and representatives of the pope. They plan to discuss whether the church should be poor or not. William brings his young novice Adso (Christian Slater) with him, and they immediately encounter a problem. Brother Adelmo recently died under suspicious circumstances, and if William doesn’t investigate, some fear the Inquisition will eventually come to check out the matters. This sets up a battle between faith and science. William adopts clinical investigation methods, but others feel that evil spirits caused Adelmo’s demise. William thinks Adelmo killed himself, but another corpse turns up before he develops his theory. Greek translator Venantius (Urs Althaus) was clearly murdered, but William remains convinced Adelmo committed suicide and he doesn’t know if there’s a connection between the two. Adso wanders the grounds and meets malformed hunchback Salvatore (Ron Perlman) who offers a possible clue. We start to get information from Salvatore about a parchment that went from Adelmo to Venantius. Assistant librarian Brother Berengar (Michael Habeck) seems to be the key, but William can’t find him, and he’s not allowed to visit the abbey’s library. The movie follows the investigation but doesn’t conclude when William makes his determination. Instead, Bernardo Gui (F. Murray Abraham) of the Inquisition comes and takes over the hunt. He runs a search for heretics, and we learn of William’s past as an inquisitor. The rest of the flick depicts what happens between the two sides and also includes the fate of a local peasant girl (Valentina Vargas) who seduces Adso. Rose moves slowly but does so for good effect. The first act of the film introduces characters and situations but also makes sure that it transports us to the particular place and time. The deliberate pacing draws us into the era and setting so we feel more a part of it, and that helps dispel most modern sensibilities. Rose doesn’t wink at us from a 20th century viewpoint, as it maintains a good period concept. This makes for an unusual setting to pursue a murder mystery. Normally a period detective story would go back to Sherlock Holmes’ time, so to get a tale in the 14th century amongst monks seems clever and provocative. This also allows for a broader philosophical bent, and that gives the movie the basis for something more than just sleuthing. The religious and philosophical elements work as both a positive and a negative. It’s interesting to get a movie with those thoughts, and as seen through William’s viewpoint, it doesn’t take them easily. We see the conflict within him, as he tries to reconcile his logical side with his beliefs. Unfortunately, the other characters don’t receive nearly that level of depth. They come across as simplistic and narrow-minded, especially in the depiction of Gui. He presents a sadist who acts solely from one point of view. He can’t - and won’t - entertain any other concepts, and his fellows don’t seem much more open. They want to suppress William’s potential heresy without any nods to reason, which may well be historically accurate but it makes the movie somewhat heavy-handed and one-sided. It forces the audience to side with William to the neglect of all else. The casting of Connery as William also creates an immediate sense of empathy for the character, as our decades of experience with the actor ensure that we’ll be on his side quickly. Despite that potential negative, I liked Connery’s work in Rose. He offers a strong, self-assured performance that develops appropriate cracks when William expresses some doubt. Connery tamps down some of his usual charisma, but his confidence comes through and makes William a good character. Slater seems less effective as Adso, but then again, the character doesn’t get much to do. Superficially, he represents the heart, whereas William is the head. However, Adso does little through the first two acts. Only when Gui steps in and wants to persecute the peasant girl - with whom Adso falls in love - does Adso develop much of a personality. Even then he feels more like a plot device than a real character, as he exists mainly to remind William of the appropriate course of action. At times, The Name of the Rose plays its cards a bit too broadly, as it telegraphs some plot points. It also wraps things up in a fairly neat and tidy manner that seems overtly crowd-pleasing. Nonetheless, the movie mostly offers an intelligent and involving mystery. It gets into unusual topics of reason versus faith in a nice way that makes it richer than the average flick. 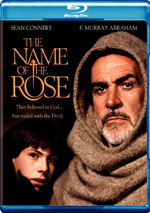 The Name of the Rose appears in an aspect ratio of approximately 1.85:1 on this Blu-ray Disc. I didn’t expect much from a movie of this vintage and genre, but the picture of Rose seemed quite solid. Across the board, sharpness was positive, as the movie seemed nicely detailed and defined. I noticed only minor examples of softness in this distinctive image. I saw no issues with jagged edges or shimmering, and edge haloes were absent. Source flaws failed to become a factor, as the movie remained clean. A mix of earth tones and grays, Rose came drained of much color. The most vivid hues stemmed from flames, blood and papal costumes, which meant the palette remained subdued and borderline monochromatic most of the time. The elements looked fine, though obviously I had little upon which to base a judgment of colors. Blacks seemed dense and dark, while low-light shots appeared more than acceptable. Those scenes abounded in the dimness of Rose, and they occasionally came across as somewhat thick, but they mostly seemed appropriately visible. Ultimately, I felt satisfied by the visuals of Rose. Though it lacked great ambition, the DTS-HD MA 5.1 soundtrack of The Name of the Rose also was quite positive given the age of the material. The soundfield mostly focused on general ambience. Not a lot of activity occurred during this somber flick, so mostly pieces like footsteps and mild environmental bits came from the sides. These seemed accurately placed but they didn’t blend particularly well, as the various elements appeared somewhat “speaker-specific”. The surrounds added light reinforcement of the front and didn’t contribute much to the equation. They seemed most active during chants or in the labyrinth, which filled the room nicely, but otherwise they remained passive partners. Audio quality was above average for the era. Speech appeared natural and crisp, with no signs of edginess or problems connected to intelligibility. Effects played a small role but they sounded clean and accurate. Music also remained fairly subdued throughout the movie. The score seemed smooth and dynamic, and the music demonstrated nice bass response when appropriate. In the end, the audio of Rose worked well for the flick. 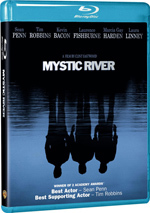 How did the audio and picture of this Blu-ray compare with the original DVD from 2004? Both show improvements, though mainly in the visual domain. The lossless DTS track showed a bit more warmth but wasn’t a big step up over the DVD’s Dolby Digital track. Picture quality demonstrated nice growth, though. The DVD looked nice, but the Blu-ray showed greater vivacity and clarity. It gave us a solid presentation of the film. All the DVD’s extras repeat here. Of primary interest, we find an audio commentary from director Jean-Jacques Annaud. He provides a running, screen-specific track that covers a lot of useful territory. Among other issues, Annaud goes into locations and sets, the novel and the adaptation, props and effects, the film’s reception in the US and elsewhere, and casting. The latter topic seems especially interesting when we hear about how Annaud almost cast John Huston in one role and how he opposed the use of Sean Connery. Though he pays the crew and cast compliments, Annaud also berates the tendency of most directors to simply praise everything, and he goes out of his way to offer some negative remarks that focus on F. Murray Abraham’s unpleasant attitude. Annaud does all of this in an anecdotal manner that makes the information enjoyable to hear. The track plods at times and suffers from a little too much dead air, but in general, Annaud offers an engaging and illuminating discussion of the film. Annaud also offers a second audio commentary - this time in French. It can be viewed with optional English subtitles, and it covers Annaud’s interest in the book, sets and locations, props and costumes, cast, characters and performances, sound and music, visual design, cinematography and influences, the flick’s reception, and a few other production issues. Once again, Annaud delivers an enjoyable chat. Yeah, it gets tiresome to have to read the whole commentary, but that’s a small price to pay for so much information. While some repetition occurs, Annaud brings out enough new info to make this one worth a listen. Next we find a period documentary called The Abbey of Crime. This German piece lasts 43 minutes and 26 seconds as it presents shots from the set, movie snippets, and remarks from Annaud, author Umberto Eco, production designer Dante Ferretti, producer Bernd Eichinger, historian Jacques Le Goff, and actors Sean Connery, Helmut Qualtinger, Christian Slater and F. Murray Abraham. We learn a little about the film’s historical authenticity, changes between the film and the book, and general elements of the production. However, most of the time it vaguely takes us through the plot and shows us the various locations. Annaud’s notes about the methods he uses to ensure authenticity are good, and some of the footage from the set also works, such as when Connery and company receive instruction in the appropriate chants. Unfortunately, too much of the show simply presents a bland recitation of the story, so this documentary only sporadically succeeds. In addition to the film’s trailer, the set ends with a Photo Video Journey. It goes for 16 minutes and five seconds as we watch photos from the production. Director Annaud offers narration that lets us know about the flick and the shoot. In essence, it comes across as a mini-commentary, for Annaud expands on production issues in this informative and useful piece. The Name of the Rose sank without a trace in America but enjoyed much success elsewhere. The film definitely deserved more of an audience in the States, as it provides an erratic but generally involving and satisfying mystery. The film’s deeper philosophical bent gives it elements unusual for the genre. 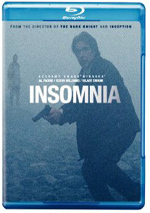 The Blu-ray presents very good picture quality plus above average sound and a mix of useful supplements. This is a fine release for a compelling movie.